Every once in a while we run across a projector that seems just right. A great feature set, wonderful image quality for the money, attractive casework and packaging... in short a product that hits the bull's eye of the target market at which it is aimed. 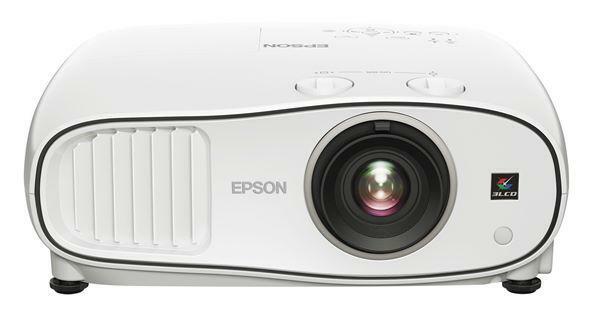 The Epson Home 10, priced at a low $1,299 and intended for the first time home theater user, is just such a product. Offering exceptional home theater performance for the price, this one should not be missed if you are looking to set up your first front projection system and don't want to spend much money doing it. Specifications. 1000 ANSI lumens, 700:1 contrast, native 16:9 widescreen format with 854x480 resolution LCD panels. Compatibility. HDTV 1080i, 720p, 576p, 576i, 480p, 480i, and computer resolutions up to XGA. NTSC, NTSC 4.43, PAL, PAL-N, PAL-M, PAL60, SECAM. Lens and throw distance. Manual zoom and focus, with a wide angle 1.54x zoom range. Throws a 100" diagonal image from as little as 8.4 feet to as much as 13 feet. Lamp life. 2000 hours in dynamic and standard modes, 3000 hours in "Theater Black" mode. Connection panel. One computer 15-pin VGA port, one set of three RCA component inputs, one S-video, one composite video, one set of audio jacks to drive the single onboard speaker, one RS-232c control port. The connection panel also features a storage slot for the credit-card size remote control. Warranty. Two-years, with "Extra Care Home Service" that includes overnight replacement in the event of a product failure. The Home 10 is a native widescreen 16:9 projector with 854x480 resolution. Video in the NTSC world comes with 480 lines per frame, so the Home 10's 480-line vertical resolution is ideal for an entry level projector. That's because each line of video information can be mapped one-to-one onto the physical display without any vertical scaling. The result is a cleaner image than you might get if it needed to compress or scale up the data to fit another physical format. Fan noise is a concern for many home theater enthusiasts. Here the Home 10 excels as well. In "Theater Black" mode, which is the best operational mode for quality movie viewing, the fan noise is very low and unnoticeable, even if it is sitting on a coffee table directly in front of you. Theater Black mode also extends lamp life up to 3000 hours which reduces long run cost of ownership. When choosing a projector, practical considerations related to desired image size and throw distance are of primary consideration. After all, your room is a certain size, you want a specific size picture, and you want to sit a certain distance from the screen. So you need a projector that will accommodate the demands of your physical space. Most projectors have zoom lenses with limited throw distance ranges, generally in the area of 1.2x. That means the picture size can be adjusted with the zoom adjustment up to a maximum of 20% for any given throw distance.